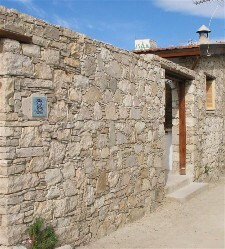 Village house The traditional stone house has been carefully restored to a high standard. It now provides a stunningly attractive and stylish home sleeping six. 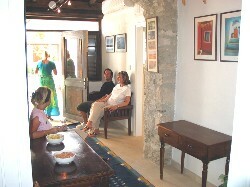 The house is comfortably furnished combining Cypriot Antiques and modern Italian bathrooms. 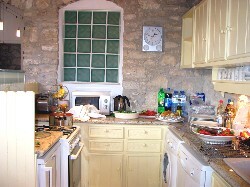 The kitchen is well equipped and there are ceiling fans in all rooms plus air-conditioning and heating. 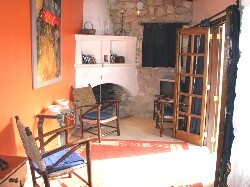 Guests need only bring their clothes to enjoy a great stay. 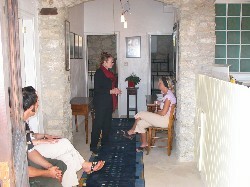 Accommodation: The house is situated in the heart of the old part of the village with views over mountains. 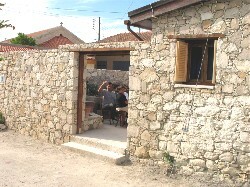 It is constructed of local stone under a tiled roof with very high timber ceilings and cream stone floors. 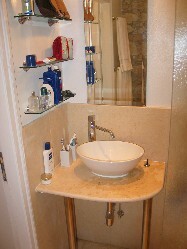 Lighting is in the very latest style and bathrooms are modern Italian with local marble. There is air conditioning and heating. Plenty of large mirrors add an extra feeling of light and space. The house consists of three bedrooms, an en-suite shower room, a family bathroom, dining area, hall, kitchen, sitting room with stone fireplace and terrace. Parking is available in the church square nearby. Sheets, blankets, towels and all kitchen utensils, crockery, cutlery and glassware are provided. 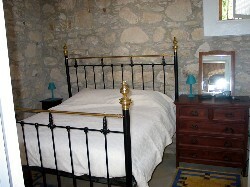 Bedroom 1 has a beautiful king-size wrought iron bed with an orthopedic mattress, two large fitted wardrobes, a dressing table and a stunning en-suite shower room fitted with local marble and the latest Italian fittings. 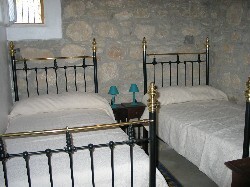 Bedroom 2 has fabulous wrought iron twin single beds with orthopedic mattresses, a wardrobe, chest of drawers and dressing table. 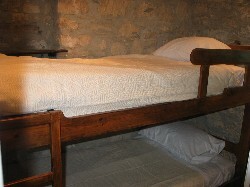 Bedroom 3 has two timber bunk beds, and a fitted wardrobe and dressing table. 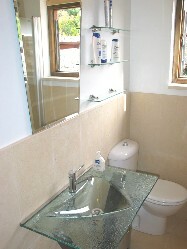 Family Bathroom made in local marble with modern Italian fittings including a full size bath with shower over. Dining is available inside and outside on the terrace with a table and six local chairs plus all tableware. Kitchen is hand made in the local style with modern appliances consisting of a fridge/freezer, washing machine, dishwasher and gas cooker plus all other equipment and utensils. Sitting Room has a great view of the terrace and the mountains beyond and contains 100 year old restored Cypriot easy chairs, an old stone fireplace, TV, and stereo. Terrace is very private with space to sunbathe unobserved, table and chairs, a pergola for shade and a small raised bed with a vine plus an old stone sink.